There are a small number of NGOs in the country, most of them affiliated to the Nauru Island Association of Non-Governmental Organisations (NIANGO). NIANGO facilitates action of the few NGOs which operate in the country. 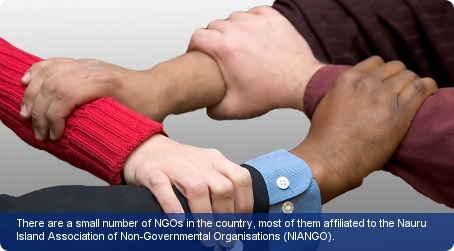 NIANGO is the country’s only recognised NGO umbrella body. As of 2007 it had 25 member NGOs. Parts of its activities are funded by NZAID (New Zealand’s International Aid & Development Agency). There is no national register of NGOs. The National Council of Women, a member of NIANGO, is the leading gender affairs NGO. It works closely with the Department of Women’s Affairs. Other NGOs working in the country include the Able Disabled group, a body of parents and friends who look into the needs of the disabled children of Nauru and the Healthy Island Council, which is made up of representatives from the national districts as well as the church representatives. Trade unions also have a minimal presence in the country as there is no current trade union structure or active trade unions in operation. Despite this, some businesses do provide support for their workers. There are no formal labour laws, although there are constitutional provisions for the right to unionise.